There are two preparatory parts to this step in the warm-up, and then the "exercise" that brings those two components together. [Because the prep portions are so long, I'm going to post this as two separate posts.] To separate the actions of the jaw and tongue, first we're going to isolate the jaw, and then we'll isolate the tongue's actions, and finally, we'll marry the two into one complex exercise. We've already visited the action of the jaw elsewhere on the voiceguy, in the basic, intermediate, and advanced warm-up series. To jog your memory, or guide you to your first exposure to these posts, we did jaw basics, jaw swinging, and head and jaw isolating. Our first prep step is to very gently work the jaw hinge. The idea here is to appreciate the complexity of the jaw, and to try to move it with ease and respect, not jamming it or forcing it to do anything untowards. Seduce it into loosening up a little. Begin by letting it drop, as best you can toward the floor, with your tongue relaxed in the bottom of your mouth. Sigh out on breath, and see whether it can release further, with your tongue tip touching the back of the lower front teeth. Begin to move your jaw up and down in very small amounts. Your mouth should stay almost completely open, so that your only beginning to close your mouth by a few millimeters, and then you open it again. (This action reminds me of when I've witnessed a dog place her mouth on a puppy to warn it to behave—not really biting, but warning that "hey, my teeth are here—you had better behave!") From the action, you want to slowly but surely increase the range of motion of your jaw on each little "nibble" to go a little further toward bringing your teeth together. Each time you open your mouth again, try to let your jaw drop, rather than pulling it open. As your swinging your jaw, it is important to attend to your breath, making sure to breathe as you swing the jaw, and not holding your breath while making the movements. This is difficult, I grant you, but it's worth it. As the range of the swinging action gets to the full range of its motion, you should be moving slowly and carefully; only go to the point where your lower teeth are near your upper teeth: they should not touch. Once you've gotten to the full-swing action, begin to limit the range of motion on how far you drop your jaw, so that slowly but surely you are making the "chewing action" smaller, until it's as if you are "nibbling" a very small seed. Then from there you should slowly expand the range of motion once again until you're back a the full range of motion. The final phase is to slowly reduce the amount you are closing, so that you eventually are making small movements with your jaw open. There are basically two major types of action for the tongue: arching up and reaching up. 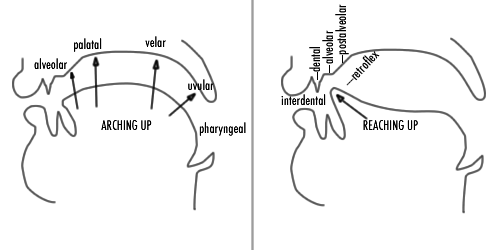 The first take the middle or back of the tongue to arches it up to ward the roof of the mouth, whether that be the pharynx, the uvula, the soft palate, or the hard palate. For these actions, the tongue tip stays down behind the lower front teeth while the body of the tongue arches up. The other tongue actions involve the front edge or tip of the tongue reaching up, either to the gum (aka "alveolar") ridge, or to other points like the back of the teeth upper front teeth, curling back to the hard palate, or reaching forward to the edge of the upper front teeth. We're doing to do a little drill of all these action/places, from the back to the front, and back again. We'll work our way through the arching actions first, and then we'll do the reaching actions, and then we'll reverse it. Drop your jaw to begin with so you're doing all this with just your tongue. With your tongue tip behind your lower front teeth, arch your tongue back toward the pharyngeal wall, and then relax it back into the middle of your mouth. Do that twice. Then arch the tongue back toward your uvula (as if you were going to make a French trilled "r"), and then relax it back. Do that twice, also. Now we need to arch up to the soft palate, like you were going to make an 'ng' sound, and then relax. Again, do it twice. Finally, arch the tongue body up to the hard palate, as if you were about to say "ya ya" [jɑ jɑ]. Finally, arch your tongue up, again, with the tongue tip down, to the gum ridge, as if your were about to tease someone with "nya nya." (Do this 2X too.) Now, try to do the sequence from back to front, with lots of breath, as if you were whispering it: back-back, velum-velum,velum-velum, palate-palate, gumridge-gumridge. And now front to back: gumridge-gumridge, palate-palate, velum-velum, velum-velum, back-back. With breath, this sounds like you're doing a series of variations on "hyuh" or "huh". Whisper all these placements without making the sound associated with them. After each sound, try to release your tongue down, into the bottom of your mouth, behind your lower front teeth. This may be quite tricky, but it's really important in improving your awareness of your tongue and your jaw. I'll use those adjectives I put at the end of each of those bullet points above as reference points as we sequence them into a chain of sounds: do each one twice, as if you were saying "thuh-thuh, tuh-duh," etc. Interdental, dental, alveolar, post-alveolar, retroflex. Retroflex, post-alveolar, alveolar, dental, interdental. So far we've isolated the action of the jaw and the tongue. We'll continue the next part of this step in the next blog post, Separating the Actions of the Jaw and Tongue Part 2.